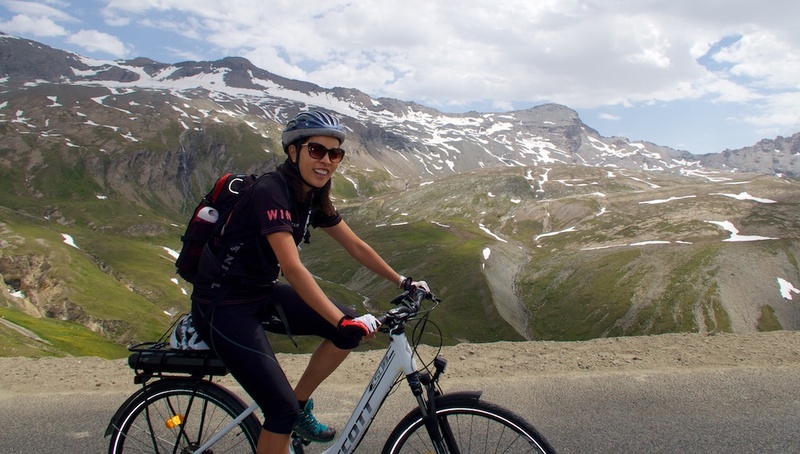 Cycling the highest mountain pass in Europe on an E-bike. 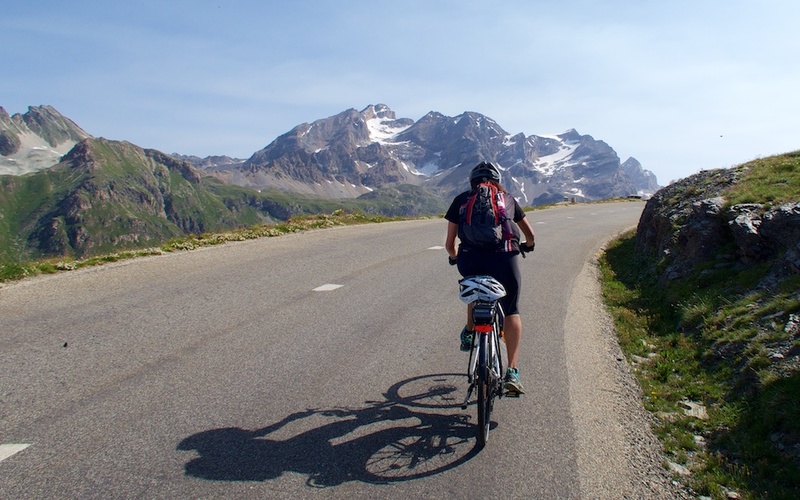 A couple of years ago, while cycling an Alp, a smiling lady of a certain age pedalled past me at speed. She wasn’t breathing heavily, and gave me a casual “bonjour.” Wow! After my initial surprise, I realised that I had just been passed by an electric bike. Last year and this year, moments like the above have become an ever more frequent event. Alpine ski stations have in recent years been more aggressive in promoting themselves as summer destinations. 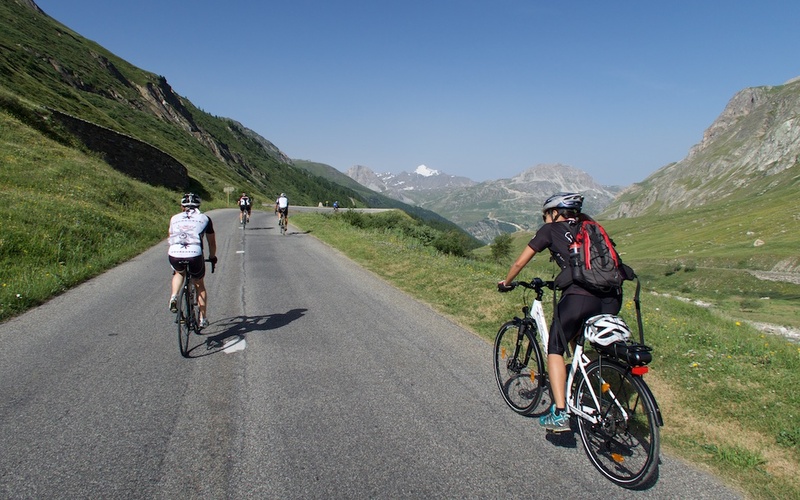 Open ski lifts servicing groomed downhill mountain bike trails, signed bike-friendly climbs, competitive and family oriented events, and now more than ever: E-bikes are being promoted as a viable option for anyone to enjoy cycling up even the biggest mountain. 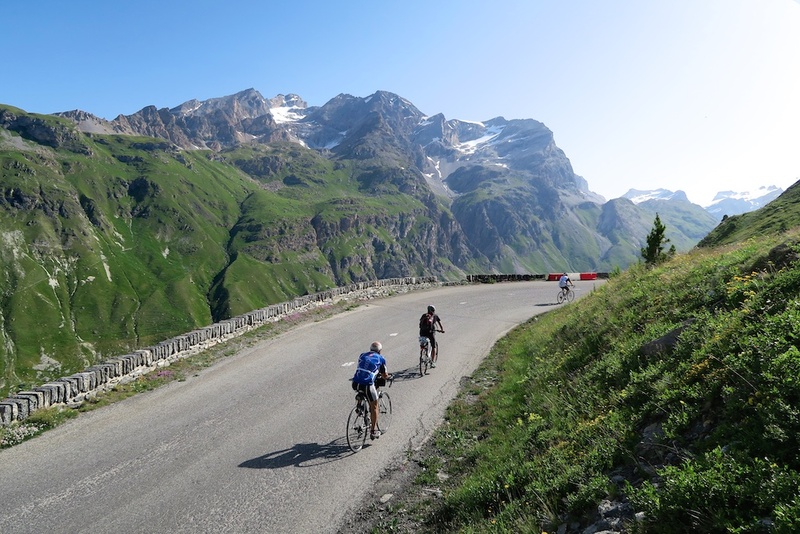 Sunday, Col de l’Iseran (the highest paved mountain pass in Europe) was closed to cars for 6 hours. Bikes only – wooohoooo. My wife has cycled less than usual this year, was not feeling her best, and was nervous about the heat. So when we noticed that our hotel had several E-bikes, she decided this would be the perfect moment to give one a try. 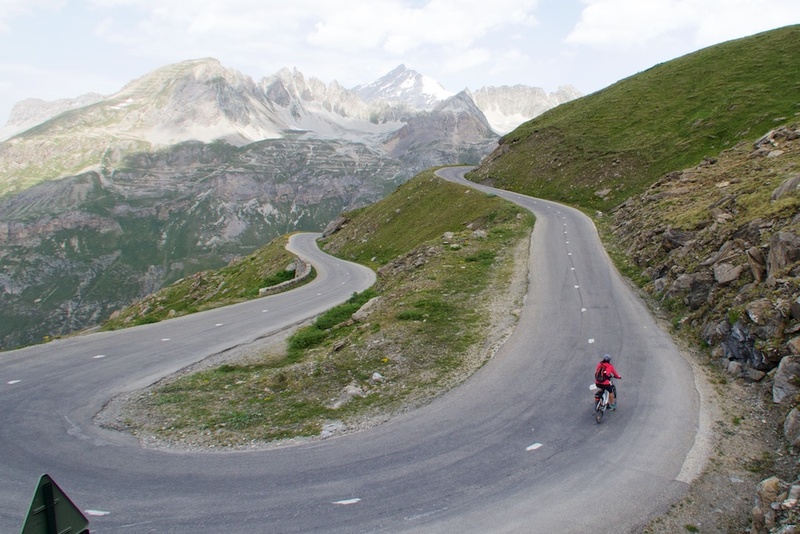 For the sake of my happy marriage, may I say that my wife has cycled under her own power many of the biggest climbs in the Alps, including Galibier, Ventoux, Bonette, Alpe d’Huez, and yes: Col de l’Iseran. She is very brave. Sunday morning we happily set off to the start line. I have been to quite a few of these bike-only days over the years, and this was one of the better attended events. 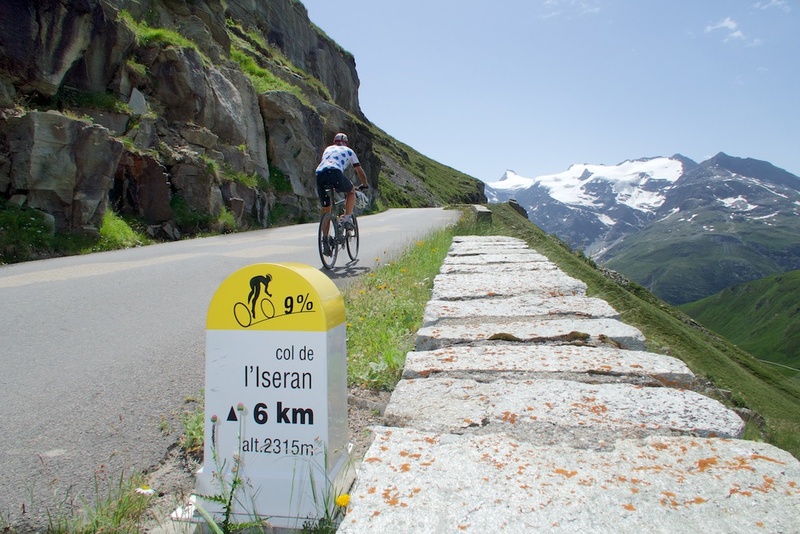 Including two previous times I have attended the Col de l’Iseran event. The interesting thing? I’d estimate 25% of participants were on Electric bikes. I’d never seen that before. In the first kilometre I found myself next to a seventy+ year old man with his wife, both on E-bikes. He was euphoric. We chatted a little. He told me that it was his first time on an e-bike and that he was so excited to be able to cycle such a mythic mountain. After wishing me a good ride, he sped away. My wife mainly used econ-mode and this still meant some effort. The beauty of these bikes is that it’s just like real cycling – but easier. And what a pleasure for us to be able to ride together for the entire climb. Often we’ll split up, or frankly I’ll have a slow day just hanging out. 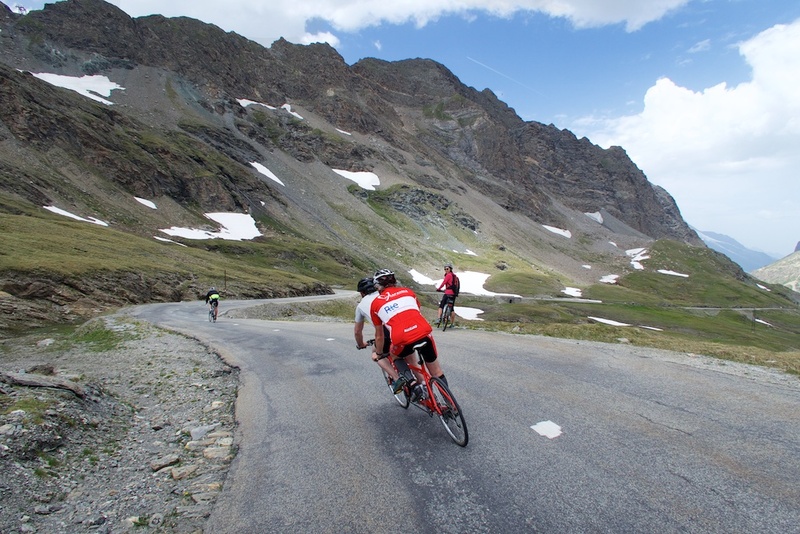 The top 17 kms of the north side of Col de l’Iseran, and the top 14 kms of the south side were closed to traffic. In 2012, I had ridden on my own and (slowly) climbed both sides. In 2013, I rode with my wife and thus we only managed one side. But with the E-bike, my wife was able to experience the stunningly beautiful and remote south side for the first time. These events have such a great ambience. Riders of all levels sharing the road. And this year, more young kids, and elderly participated in large part due to the rise of the E-bike. One lasting image of the day will be of a fairly round old lady wearing a polka dot jersey passing me a couple of times with a huge grin on her E-bike. Nice. A perfect example of the benefits of an e-bike! Wonderful that you two could enjoy this experience together. And that you could do it car-free — These events are definitely worthy of supporting as much as possible! hi Will, been following your site for some time. it’s inspirational and I really appreciate the lengths you go to in producing suh beautiful photos supported by succinct route description and climb profiles. My wife and I are spending the summer in Bozel in Vanoise. Can you let me know of any other traffic free dates that are happening in July/August. Thanks a lot. Did the Saisie today to watch the TdF. Then enjoyed the descent from col de bisanne back to Quiege where we’d parked. what a day. Glad to see a French stage win but Froomie getting up from his fall without losing his maillot jaune. cheers will. Yes done loads of mtb all around 3 valleys and on the jovet area. injury forced me onto the road bike in may 2015. I’ve hardly been off road since. my myb is back in the lake district in england. however definitely second your tip. jovet is a cracking climb. if you’re ever over this way feel free to message me if you fancy a riding partner. I’m an unfit 45 yr old can manage to average about 10kph up saisie yesterday.